Nokia shares are hitting a 16-year bottom today, but as the Finns are losing more and more of that scarce investor patience, a leak straight out of Nokia offices comes to save the day. It’s not just the Nokia Lumia 1001, that is coming, there’s a total of five new handsets that Nokia is likely to bring to market soon, according to devs tinkering with the company’s Remote Device Access (RDA) program. Basically, what the RDA does is allow programmers to test their apps on a remotely located Nokia device, so they don’t have to buy the gadget themselves. Imagine a room filled with Nokia devices, all easily accessible remotely. This full access allows devs to see nearby Wi-Fi networks and other devices, and that’s exactly how five new Nokia devices were first spotted. The Nokia 510 and Nokia Belle 805 are the first two and it seems these are a pair of Symbian devices. The 510 looks like a successor to the low-end Nokia 500 and it’s likely to be a basic smartphone for an affordable price, while the Belle 805 if released should be a simplified version of the PureView 808. Next, we have three new handsets running on Windows Phone. The Nokia Lumia 920, 950 and 1001 showed up on the RDA program. The 920 and 950 look like a continuation on the Lumia 900 theme, but we have no details about them, just guesses. The Nokia Lumia 1001 is the last mysterious Nokia phone and judging by the model number, if it indeed gets unveiled it should bring some sufficient innovation in the ecosystem. In any case, the last three phones will likely get Windows Phone 8, too. agree with you but i dont want them to kill symbian, they should put the OS on low end! and make meego as there OS for mid range to high end as a buck up for WP8! just a supporter! and i hope that they will let the android apps ported on meego! it will be sweet! I wonder if manufacturers have to pay WP license fees to MS. If not how MS can make profits from their investment, if not then how they can compete with Android. They will make money on the marketplace. As far as I know profits from marketplace are miniscule for Google and not a big sum for Apple either (comparing with hardware sales). For MS the business model is always OS license fees, for that WP must have some killer features to justfy the license fees. As of now Android is superior in every way and MS still have to spend and spend. Yes, the phone manuf. pay license fees to MSFT for WP. Nokia has an alliance where the cost of said license is in the balance against Nokia assets shared within the entire MSFT ecosystem (mostly location based services). Looking for a Lumia 710 replacement price and specifications wise and with WP8 of course. That would be the sweet spot. Nokia Lumia 1001 is not a phone, but a RT tablet. comments such as the above is the reason why i like reading comments, some people think out of the box. Who says it runs WP8? RDA tool just shows out different models out there, wich runs different platforms like WP, Symbian, S40/S60 and Meego. RDA doesn't limit devices only to WP8. 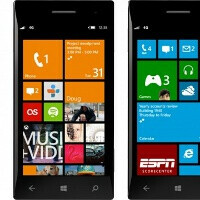 A WP8 phone with PureView would be a serious contender in the upcoming market. i think Lumia 1001 is a tablet since numbers 8-9 is high end smartphones then 5,6,7 are midrange then 2-3 are low end!